When it comes to bringing your own alcohol aboard a cruise ship to avoid paying high prices at the bar or to make sure you have access to your favourite tipple throughout your voyage, different cruise lines have different policies. Some lines might let you get away with bringing the odd bottle on-board, while others take a stricter approach. So what are the best ways to sneak you booze aboard? When you book your cruise, your cruise line will no doubt offer you a range of excursions to enjoy whilst in port. Shore excursions are fantastic way to truly experience and immerse yourself in each new destination on your itinerary and are therefore highly recommended. However, if you are looking for the perfect guided city tour, a private trip to an ancient landmark or an adventurous jungle trek whilst ashore, you’re cruise line may not always offer the best deal. Make sure to check with your agent where to get the best deal on shore excursions when you book. There are a number of independent websites and companies out there which offer the same exciting range of guided and tailored shoreside experiences but for a cheaper price. Prearranged shore excursions are a brilliant way to get the most out of your voyage, but don’t be a sucker – make sure you get the best deal by shopping around. Most cabins are metal – so take magnets! This may seem like a strange and pointless tip, but it’s actually a novel and efficient way to keep all of your documents, letter and papers organised and on display in your cabin. Most cruise ship cabins are made from metal and are therefore magnetic, so make sure to bring some magnets in your suitcase – or buy some as souvenirs in port – to make the most of this often overlooked cabin feature. You can use your stash of magnets to help organise all of your papers schedules, plans and invitations – simply pin them between a magnet and the cabin wall. Then whenever you come back to your cabin, all of your dining reservation slips, exclusive party invites and activity schedules will be on display and well organised, so you can keep on top of daily plans with ease. If your cruise is due to embark from a port overseas, it is important to make sure that you have all of the necessary flights and transfers arranged well in advance of your departure date – you don’t want to miss your ship! Cruise lines will often offer to book your flights and transfers for you for a fee, but once again, this is by no means the best option and there are more affordable ways to get to your embarkation port. 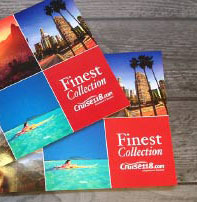 Most cruise travel agents offer package deals when you book a cruise. These deals often include all flights and transfers within the original price you pay – a fantastic way to get more for your money whilst taking the hassle out of travelling to you departure point. Whether you’re setting sail from a European city like Barcelona or Venice, or embarking on the other side of the world at ports such as Sydney or Singapore, always check what package deals are available. Room service is complimentary, so why not eat for free? With many cruise lines, room service is completely free of charge – apart from tips and gratuities for the crew which are generally expected – so why not enjoy a free meal or snack delivered directly to your suite or stateroom? I wouldn’t recommend doing this every day of your cruise, as cruise ships always offer a marvellous variety of amazing speciality, main and casual dining venues in which to enjoy truly excellent cuisine, and although many may require a cover charge, they are usually well worth the extra cash. Having said that, there is no harm in enjoying a night or two in your cabin, spending time alone with your loved ones and ordering complimentary room service to enjoy in their privacy of your accommodation. Cruise lines usually offer a fantastic choice when it comes to room service, from tasty bites and tempting desserts, to international dishes and local favourites – all available without burning a hole in your pocket. Embarkation day is always a tiring and stressful day, even for the most experienced of cruisers. Once you’ve finally boarded your ship, found your cabin and unpacked, you will likely have worked up an appetite. Your first thought will probably be ‘let’s head to the buffet’, but beware – so will everyone else’s! The buffet area will often become very busy and overcrowded on your departure date, as hundreds of hungry guests arrive looking for a quick and easy meal. One way to avoid the stress of a busy buffet and still enjoy a fabulous meal is to sample your ship’s speciality dining on your first day aboard. Most people will not try the speciality dining venue until later in their voyage, so it will often be much quieter than usual during the first day at sea – ideal for cruisers looking to enjoy a gourmet meal in more peaceful surroundings after a busy day boarding their ship. No window in your inside cabin? No problem! For anyone looking for good value from their cruise holiday, an inside cabin is always the best option as they are priced much cheaper than ocean view cabins, balcony staterooms and suite accommodation. One of the downsides of an inside cabin, despite their lower cost, is the lack of window – and therefore lack of sunlight and ocean view. There is, however, an ingenious solution to this obvious drawback. Cruise line’s will often provide a live bridge cam feed straight to every television on the ship, so simply find the right channel on your in-room TV and – hey presto – there’s your own improvised ocean view. Tuning into the bridge cam channel from your inside cabin first thing in the morning is also a quick and easy way to check if the sun has come up yet in whichever exciting corner of the world you happen to be sailing in. Spending a soothing afternoon at your ship’s on-board spa is a wonderful way to kick back, relax and enjoy a range of indulgent treatments designed to rejuvenate and refresh. While spa treatments may be good for the mind, body and spirit, they are often not so good for the wallet, as cruise lines charge extra per treatment for those who want to spend time in the spa. The best way to avoid expensive charges for treatments, but still enjoy a relaxing session at the spa, is to arrange your spa treatments for days when the facility is much quieter, such as port days and the last day of your voyage. The spa will tend to lower its prices when there is less demand for treatments, so if there is a port on your itinerary that you have seen before or doesn’t particularly interest you, it could be the perfect opportunity to head to the spa for a day of rest and relaxation. Speaking to someone with years of experience in cruising is the best way to make sure that you avoid any pitfalls and have the best cruise holiday possible. Our expert cruise concierge team are on hand to answer any questions you may have prior to booking. Just give us a call on 0207 980 2847 if you’d like a chat.